This computer, weighing only 1.3 lbs, could operate for 10 hours on just two AA batteries and provided Microsoft Works (word processing, spreadsheet, database, and communications programs) as a built-in environment. Original purchase documentation in Accession Folder. 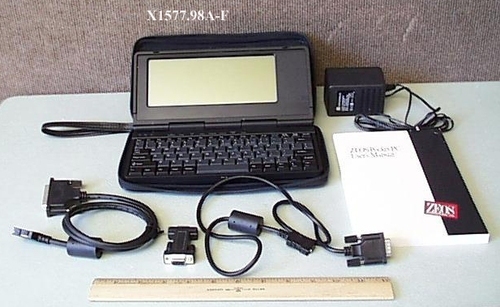 This item comprises six (6) pieces: A: CPU B: Carrying Case C: AC Adaptor D: Null MODEM adaptor E: Proprietary parallel cable F: Proprietary serial cable Also includes 1MB PCMCIA RAM Expansion module Batteries required: 1 x CR2032 Lithium (for memory backup) 2 x AA (for main power) All batteries removed from equipment.